Over the centuries, dance has been instrumental in awakening us to ourselves, and in strengthening the bonds to our communities and to Nature. The essays in this volume show how dance can be both empowering and exhilarating, and the transformative power it has to renew and rebuild those bonds. Widely interdisciplinary in nature and written by women dancers from around the world, these essays illustrate a rich array of dance practices and cultures. Join these women as they delve into indigenous dances from Native American and Hawaiian cultures, folk dances from Eastern Europe, Turkey and the Middle East, sacred dances from India and Tibetan Buddhism, and improvisational dance. In the process, they not only re-discover their bodies and themselves, but also their connections to other women across generations and with the sacred, to experience that sense of belonging to something greater. A rich source of information and inspiration… it is refreshing to read such academic yet enjoyable experience-led theory and practice in dance as a sacred and healing process… the poignant experience and knowledge of the writers should invite any readers who are interested in the area of movement and dance. This book has great value at this moment in time. It is a fascinating look into the possibilities of a deeper experience of the mind/body/spirit nature of livingness… They are inspiring to read and invite me to deepen my own participation in these discoveries. Impressive. 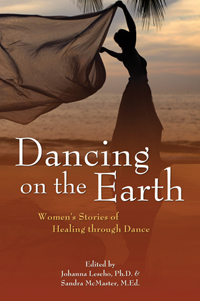 Dancing on the Earth: Publication date 01 July 2011 – 15.75€ + 4€ postage & handling.